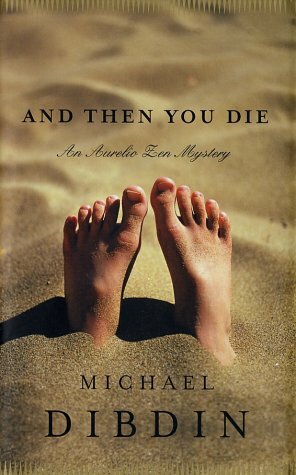 And Then You Die ***SIGNED REVIEW COPY*** by Michael Dibdin: Pantheon Books, NY 9780375421884 Hard Cover, 1st American Edition, 1st Printing., Signed by Author on Full Title Page - William Ross, Jr. Edition: 1st American Edition, 1st Printing. Aurelio Zen of Rome&#x2019;s elite Criminalpol is back&#x2014;but nobody&#x2019;s supposed to know it. After months in the hospital healing from wounds sustained in a bomb attack on his car in Sicily, he is lying low under a false name at a beach resort on the Tuscan coast, waiting to testify in an imminent anti-Mafia trial. In the meantime, he has nothing to do but enjoy the orderly and undemanding world of a classic Italian beach holiday: spending his days in his assigned chair on a well-managed strip of pale sand, eating splendid seafood, and engaging in a mild flirtation with the attractive woman sitting under the next umbrella. Until he notices that an inordinate number of people&#x2014;each of whom might have been mistaken for Zen himself&#x2014;have been dropping dead around him. Now it seems to be just a matter of time before the Mafia manage to finish the job they bungled months before on a lonely Sicilian road.<br /><br />But though Zen has been out of commission for months, he hasn&#x2019;t lost any of his highly developed, legendary abilities to navigate treacherous waters. When he finds himself suddenly back in action, he begins to feel more alive than he has since the moments before he was almost dead, which might help keep him from being almost dead&#x2014;or worse&#x2014;yet again.<br /><br />In <i>And Then You Die</i>, Michael Dibdin has given us a suspenseful, sharply funny new chapter in the always unexpected and uncommonly entertaining saga of Aurelio Zen.